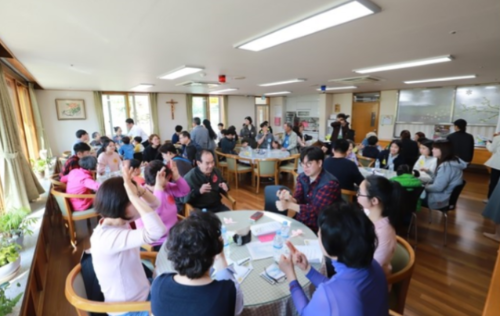 On April 21, St Joseph nursing home held 2 days long sign language camp, aiming at the integration of the hearing impaired residents into the local society and also improving the local people’ perception about the disabled by means of the association in the camp activities. We opened to all the beautiful surroundings of our house. Many interesting programs had been organized by the youth group and volunteers from nearby districts or the communities of the handicapped. Around 120 guests had participated from the beginning of preparations and could manage programs helping one another. The local chief administrative and concerned leaders from different local institutes had attended to the tape-cutting ceremony to promote the success of our camp. The handicapped were leading each program and many participants who came in a family living nearby were particularly happy joining in programs such as learning the sign language, quiz in S.L., the exhibition of photographs taken by the residents, treasure hunt in S.L. picture, singing contest in S.L. and making natural soap contest. It was a wonderful experience given by God to create fellowship with residents and volunteer guests mingling together in beautiful nature.